When did humans first consider the possibility of alien life? 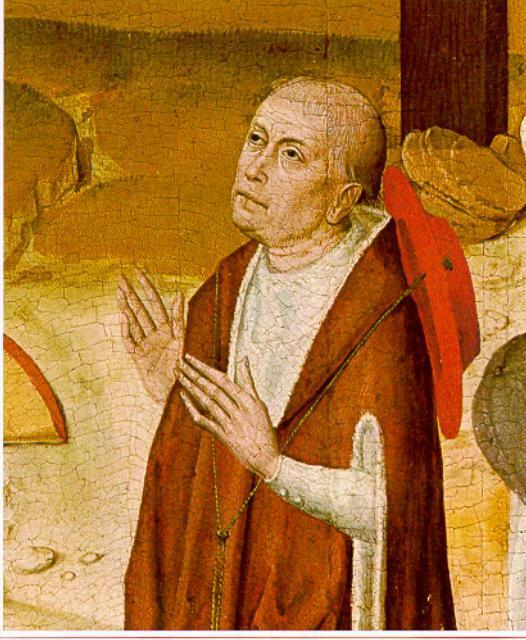 Nicholas of Cusa, in the painting by Meister des Marienlebens, circa 1480. This all sounds deceptively modern and scientific to us, but it should be remembered that their conception of “atoms” was nothing like ours, nor was their idea of “other earths.” They definitely did not see these “other earths” as circling the stars, since they had no conception of the stars as other suns and saw them as a distinct sphere in our “world.” These hypothetical “other earths” were systems beyond ours and remote from it—a bit like the idea of multiple universes in modern physics. Epicurean speculation about multiple worlds was too abstract for the Aristotelians, who preferred what could be observed to what could simply be imagined. Given the heavy influence of Aristotle on Western philosophy and protoscience in the Middle Ages, this meant the idea of “many worlds” took a back seat. But it was not completely disregarded. This was because Aristotle claimed that these multiple worlds were impossible, and medieval theologians took a dim view of claims that put limits on the omnipotence of God. So the claim that there could not be multiple worlds was actually one of the very few things in Aristotle that the doctors in the faculty of theology told their colleagues in the faculty of arts they definitely could not state as fact. This left the idea of multiple worlds and speculation about them wide open. Life, as it exists on Earth in the form of men, animals and plants, is to be found, let us suppose in a high form in the solar and stellar regions. Rather than think that so many stars and parts of the heavens are uninhabited and that this earth of ours alone is peopled—and that with beings perhaps of an inferior type—we will suppose that in every region there are inhabitants, differing in nature by rank and all owing their origin to God, who is the center and circumference of all stellar regions. Of the inhabitants then of worlds other than our own we can know still less having no standards by which to appraise them. It may be conjectured that in the area of the sun there exist solar beings, bright and enlightened denizens, and by nature more spiritual than such as may inhabit the moon. … [W]hilst those on earth are more gross and material. If it be inquired if men exist on that world and whether they have sinned as Adam sinned, I answer no, for they would not exist in sin and did not spring from Adam. … As to the question whether Christ dying on this earth could redeem the inhabitants of another world, I would answer that he is able to do this even if the worlds were infinite. But it would not be fitting for him to go unto another world that he must die again. So not only did later medieval scholars speculate about inhabited extraterrestrial worlds, with their own people, wildlife, and plants, but medieval theologians did not seem to have too much trouble accommodating these ideas into their religious conception of man’s place in the cosmos and the redemption of Christ’s death. Really? This would have been news to Nicholas of Cusa, whose book in which he explored these ideas was highly regarded and extremely widely read. He was made a cardinal of the Catholic Church and acted as papal legate. Strange sort of heretic. Nor was William Vorilong persecuted or considered heretical in any way. He did know a thing or two about such accusations, since he objected to the English trying to accuse Joan of Arc of heresy and refused to take part in her trial in 1431, declaring it a travesty of justice. So both ancient and medieval scholars speculated about “aliens” in some sense, though it was only in the later Middle Ages that the first speculation about inhabited extraterrestrial worlds in our cosmos appeared. Middle Ages: What was the advantage of using one-handed swords over two-handed swords? When “X” Questions: What is the escape route when you know that you are in the wrong academic field? Extraterrestrial Intelligence: How would we tackle an alien invasion?